On Feb. 2, Rep. Jason Chaffetz, R-Utah, announced his intention to withdraw a bill proposing the transfer of 3.3 million acres of federal lands to 10 Western states. “Groups I support and care about fear it sends the wrong message,” he explained, alongside a photo of himself in camo, a dog in his arms. Only a week had passed since he introduced the legislation, but sportsmen’s groups had taken to social media swiftly and aggressively, impelling their members to speak out publicly against it. Chaffetz’s H.R. 621 is one of several recent proposals that have struck a nerve with sportsmen. Many fear they’ll lose access to the federal lands where they hunt and fish if those lands are transferred to states, which are likely to sell or develop them. The hook-and-bullet contingent has long played a significant role in conservation — especially economically, via taxes on firearms and ammunition as well as through hunting and fishing licenses. But now, more are putting their mouths where their money is: speaking out online, signing petitions, attending rallies and town halls. Galvanized by escalating threats and the national sweep of activism since the election, sportsmen are poised to play a key role in public-lands legislation under President Donald Trump’s administration. Generally, they tend to be more conservative than other outdoor groups, supporting gun rights and small government. “We do have a little more credibility in some conservative circles,” says Steve Kandell, sportsmen’s conservation project director for Trout Unlimited. 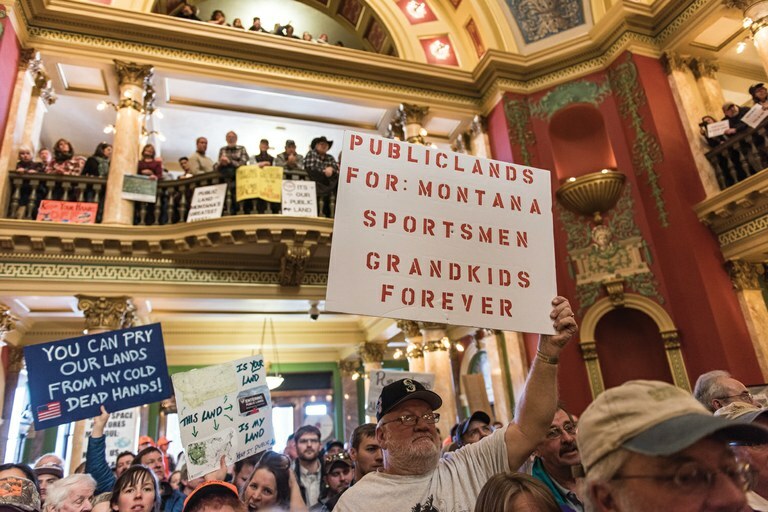 Conservation groups including hunters, anglers, hikers and horsemen gather at the Montana state Capitol in Helena in January to protest the idea of the federal government transferring public lands to the states. The Malheur National Wildlife Refuge occupation in January 2016 “woke people up,” says Land Tawney, president and CEO of Backcountry Hunters & Anglers. Although the Sagebrush Rebellion began decades ago, the “return the land” rhetoric of the Bundy family and their supporters made more sportsmen realize how deeply a small — but increasingly vocal — contingent of Westerners resents federal management of public lands. And “the drumbeat has really ramped up since the election on these issues,” says Whit Fosburgh, Theodore Roosevelt Conservation Partnership president and CEO. Under the Trump administration, sportsmen could wield significant influence — and not just because many of them vote Republican. It helps to have legislators and leaders who can identify with sportsmen’s connection with public lands, notes Kindle: rising before dawn and hiking miles in the dark, being “purely quiet” while watching for wildlife. Trump’s son Donald Jr. is a “Life Member” of Backcountry Hunters & Anglers, and Interior Secretary Ryan Zinke also hunts. And Chaffetz is among the nearly 300 members of the House and Senate who make up the long-standing bipartisan Congressional Sportsmen’s Caucus. George W. Bush’s administration heeded sportsmen when they spoke out against threats to environmental protection: In 2004, hunters and anglers met with Bush and encouraged the administration to abandon Clean Water Act revisions that would have threatened wetlands and streams valuable to fish and wildlife. Hook-and-bullet groups may also serve as a bridge between traditionally left-leaning environmental groups and the current administration when it comes to public lands. Threats to public lands are “creating one of the biggest unlikely alliances in the world,” says David Allen, president and CEO of the Rocky Mountain Elk Foundation. As Tawney points out, sportsmen tend to take a middle-ground approach, while the environmental community creates a more ambitious “goalpost” to work toward. This allows groups to make more centrist deals.